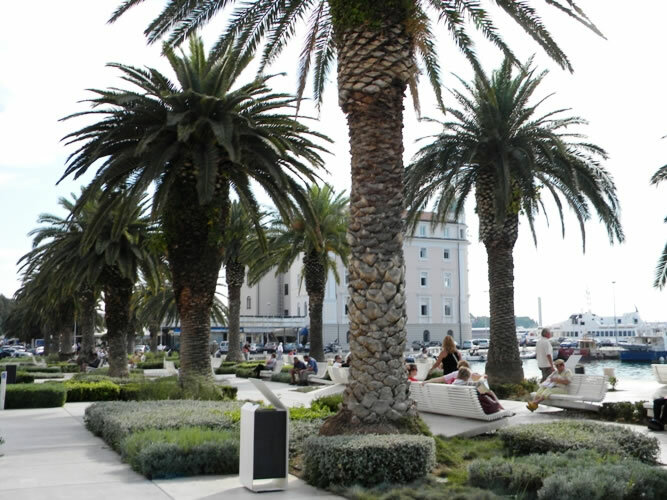 Of all the places Emperor Diocletian could have chosen in the vast Roman Empire to build his retirement palace he selected present-day Split, Croatia. I know why. Croatia’s Dalmatian Coast and Mediterranean climate can not be surpassed. Even though it was built in the 4th century, parts of Diocletian’s palace are still in use making it one of the best-preserved Roman sites. 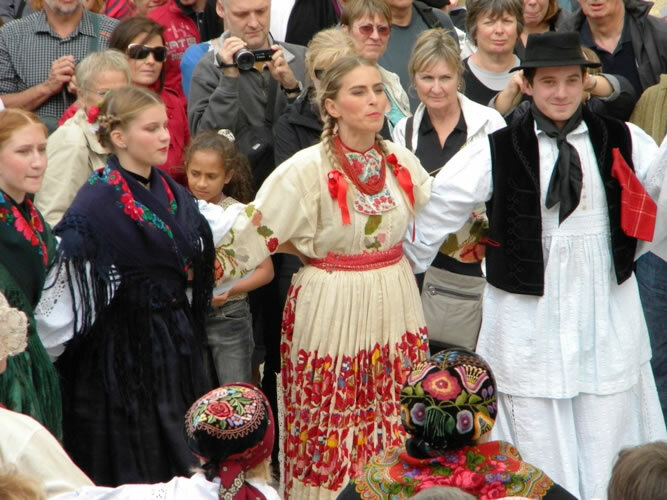 The UNESCO site is the living pulsating heart of the city. My Croatian journey started in Zagreb, which became the capital of the newly formed country of Croatia in 1991, but its history is at least a thousand years old. The newly remodeled Regent Esplanade Hotel opened in 1925 for passengers on the Orient Express and exudes the aura of an earlier era. Located near the train station it was only a short walk to the free trolley to the center of the city. From the large square in the Lower Town where people were sipping coffee in the cafes I walked up through the colorful flower market to the Kaptol Square in Upper Town. After a visit to the Cathedral I continued up to the Museum of the City of Zagreb housed in the Convent of St. Clair. It provided a wonderful overview of Zagreb and Croatian history. Just what I needed to set the tone for the rest of my journey. 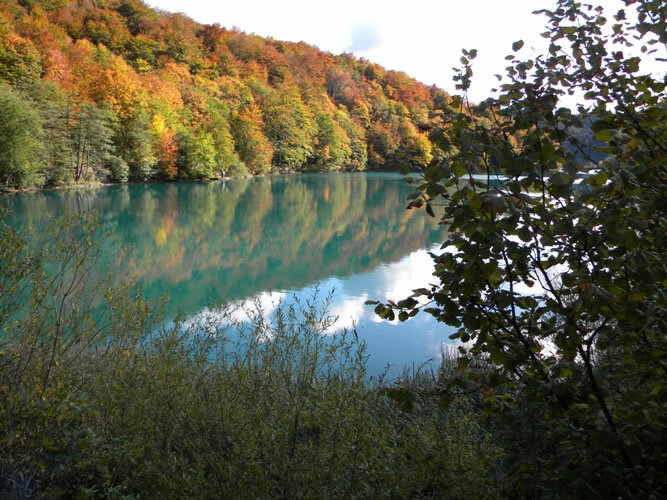 From Zagreb I headed to the coast taking the advice from a fellow tourist, “Don’t miss Plitvice Lake National Park. It is beautiful.” The day started out rainy, windy and cold – even for October. About 30 minutes before I arrived at Plitvice Lake the clouds disappeared revealing a blue sky that was the perfect backdrop for the brilliant fall leaves. For four-hours I wandered the trail along the lakes and past waterfalls. Le C Lav, my home in Split, offered a wonderful mix of exploring and relaxing. The hotel shuttle delivered me into the city center where I explored the Palace of Diocletian slowly on foot. I wonder what Diocletian, noted for his persecution of early Christians, would think if he knew that the temple that was to be his mausoleum is now the Cathedral of St. Dominus. Not to miss are the Temple of Juniper guarded by a headless sphinx and the basement halls revealing more of the palace’s 4th century structure. Split is an ideal base for visiting the ruins of the ancient city of Solin, picturesque islands, and small towns. 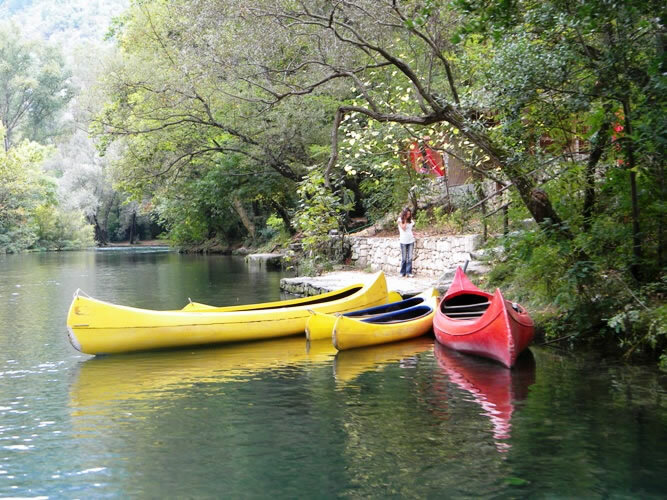 In the nearby town of Omis I took a boat ride on Centina River to the rapids where whitewater rafters were just finishing their run. The river seems to disappear between the towering cliffs making it easy to understand why it was once the perfect hideaway for pirates. At the end of my daily exploring I returned to the Meridien to swim, enjoy the Diocletian Spa, and even took a cooking lesson. “The ferry from Split to Dubrovnik is too long. Take the bus,” advised another traveler. I was glad I didn’t heed that advice. The scenery from the relaxing nine-hour ferry ride was wondrous. The ferry stopped for a short time at Hvar, Croatia’s most popular and luxurious island, and Korcula, an enchanting walled city. 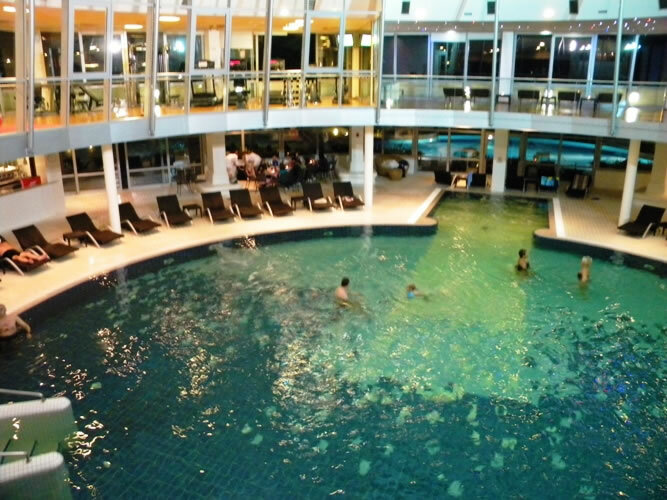 The newly opened Radisson Blu Resort and Spa is where I started my stay in Dubrovnik. 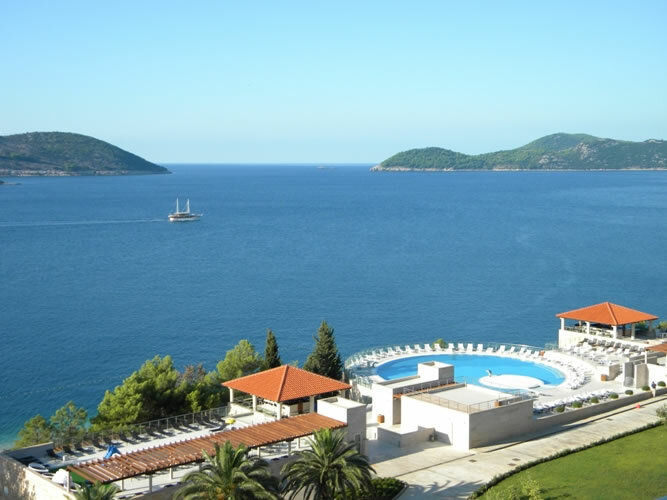 The panoramic view of the islands and the blue Adriatic from the balcony of my room was mesmerizing. 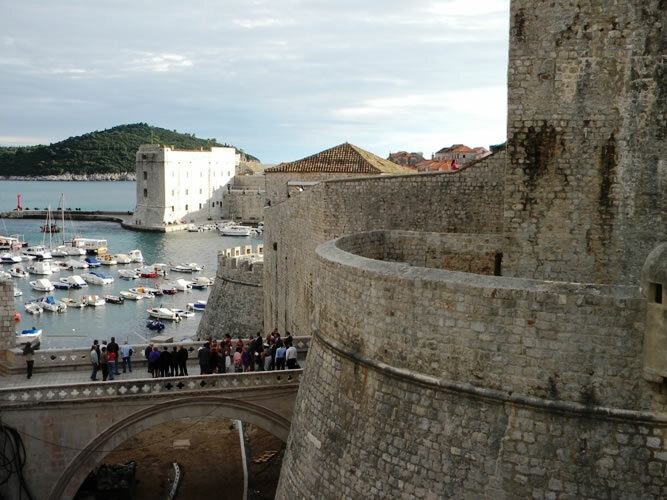 I made use of their three pools, spa and the bus shuttle to the walled city of Dubrovnik. Dubrovnik enchanted me, so after several relaxing days at the Radisson Blu the hotel’s shuttle dropped me at Pile Gate, the main entrance to Dubrovnik, which is as far as vehicles can go. Crossing the drawbridge I recalled reading that in the 1500s the bridge was lifted every night, the large heavy gates closed and locked, after which the key was handed to the prince. It was only a short walk to my new home, the newly remodeled Roko Apartments. Each day I wandered the morning market in the large square near Pucic Palace where the scent of lavender filled the air, had coffee at a café, explored the streets, bought freshly-made stuffed peppers for my dinner from the deli, and people-watched from the steps of St. Blaise Church. Dubrovnik is a living museum – a city where people live, work, and play and have since the seventh century - that is what makes it so special. Add to that the fact that during the war in the early 1990s over half of the buildings were hit and several palaces destroyed. Now completely restored only the signage at the city gates pinpointing the places hit during the shelling reminds visitors how the city suffered. The impressive city walls were built between the 13th and 16th century. My leisurely three-hour stroll atop the city walls afforded me spectacular views. One day I took the shuttle boat from Dubrovnik to Lokrum Island and wandered through the botanical garden. Like Split, Dubrovnik could be a destination onto itself as there are plenty of things to do including visiting museums, attending concerts, taking boat trips to various islands, and plethora of sport activities from swimming to kayaking. My last night I enjoyed a candlelit string quartet concert in the 16th century St. Saviour Church. It was the perfect end to an amazing trip. The weather during September and October along the Croatian Riviera was sunny and warm, and the hoards of summer tourists were gone. I told a local resident that, “I’d love to spend a month in Dubrovnik.” He warned, “Watch out. My family came here on vacation in the 1970s and we are still here.” Lucky them!